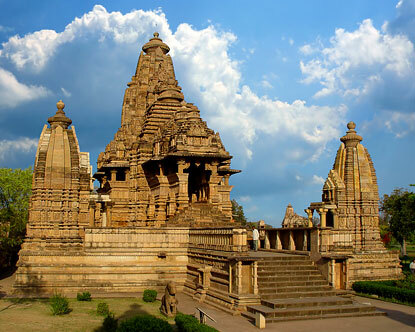 The Eastern group of temples comprises of Hindu and Jain temples. The largest Jain temple, Parsvanath temple belong to the eastern group. The image of Parsvanath was installed in 1860. The sculptures on the northern outer wall of this temple, make this temple the finest temple in the eastern group. On this temple there are carvings of a woman bending thoughtfully over a letter and a damsel removing a thorn from her foot. The sanctum also has a throne facing a bull, which is the emblem of the first Tirthankara, Adinath. On the north of the Parsvanath Temple lies the Adinath Temple. Another Jain temple is the Ghantai Temple. On the walls of this temple the images depicting the dreams of Mahavira's mother and a multi-armed Jain goddess riding on the winged Garuda are beautifully carved. Brahma, Vamana and Javari temples are the other three Hindu temples. 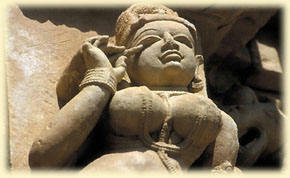 A double row of apsaras (celestial nymphs) adorn the outer walls of the Vamana Temple in a variety of sensuous attitudes. Granite was used in the construction of the Brahma Temple.